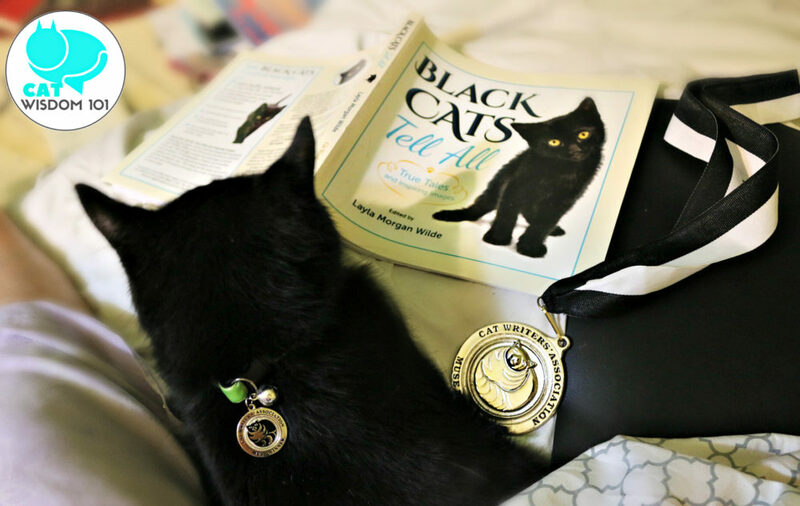 Cat Wisdom 101 Wins Book Awards For Black Cats Tell All: A Global Awareness Win for Every Black Cat. by feline editor Clyde and contributor to Black Cats Tell All. Welcome to my first blog post of summer 2018. It’s Clyde and if I was younger or more athletic, I’d be jumping for joy. I have several reasons to celebrate. First and foremost, I’m feeling pretty darn good for 18 and a half. I think all cats should celebrate half birthdays once they reach their senior years. Do you agree? Whether you’re feline or human, good health is everything. Material things like fancy food, expensive toys or treats are nice, but I prefer being loved and cared for. Okay, a little spoiled. I adore my creature comforts like the cooling pad and personal air conditioner my folks got just for me. Unlike most cats, I don’t enjoy the heat. My fursibs are furry heat-seeking missiles who reveled in our recent heatwave. I’m lucky to have humans who cater to our individual well being. That’s love, compassion and awareness rolled up in one purrfect package. Speaking of packages, a special one arrived the other day. 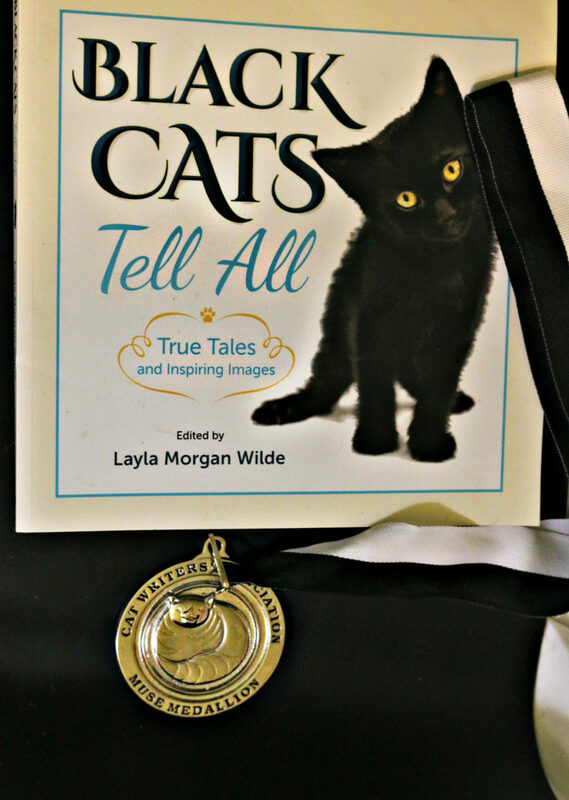 My other reason for celebrating is our book, Black Cats Tell All:True Tales And Inspiring Images won another award. Actually two. 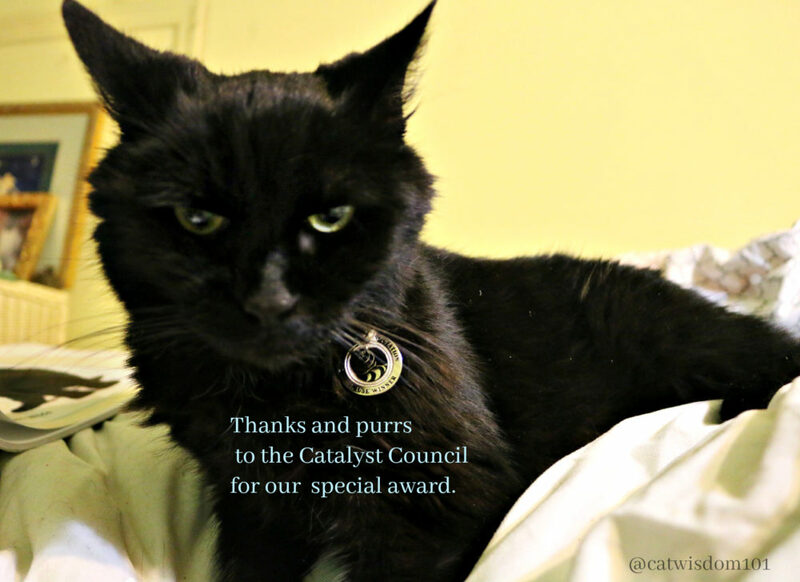 We’d already won a certificate of excellence from the CWA (Cat Writers’ Association) but it took top honors to win the coveted MUSE Medallion award and an unexpected special award from the Catalyst Council. It arrived after we posted but we’re thrilled and honored. They have excellent resources for vets, shelters and cat owner, so do check them out. The awards are truly a win for all black cats. We’ve worked hard to create awareness for black cat adoption and this book with its extended global communities are making a difference. Since we launched our Black Cats of IG on Instagram, black cat accounts have doubled with serious black cat lovers. There is still much to do but we accomplished what we set out to do. 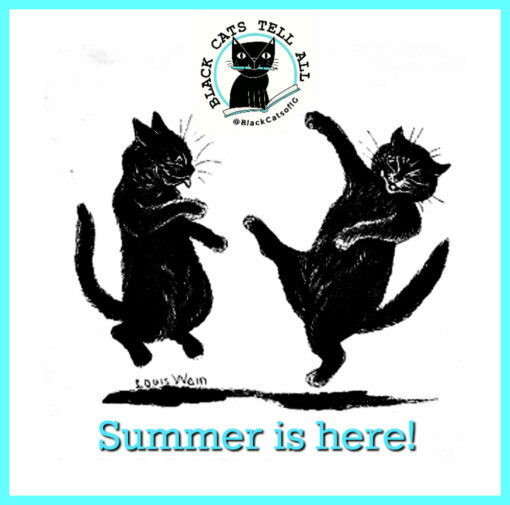 The rest is up to the ever growing network of black cat lovers and advocates like you. My mom Layla, thought I deserved the award since I’m her muse and I’m a contributor of one of the stories. All the stories in our nonprofit book are narrated by the cats and mine (in case you want to read it) is “The Catnip Made Me Do It”. Of course I’m tickled to be bestowed this honor. I mean, I’ve never won anything before but I didn’t understand why Layla thought I should pose with the award. As you may know, the camera and I are not best friends. I’m a rather reserved fellow and besides, I’m a muse not a model! This is our first MUSE win for a book but we’ve previously won three for photography. Odin is more showy than me and didn’t mind wearing his award. 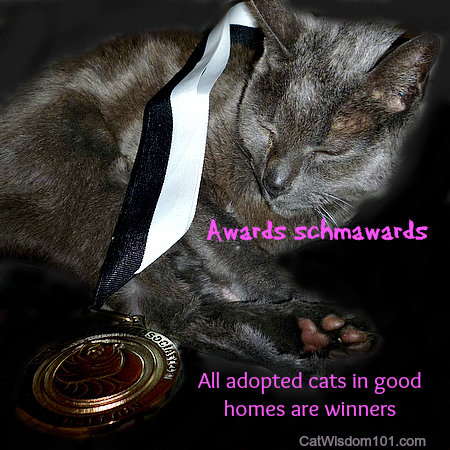 I’m inclined to agree with the late, great Gris Gris who preferred adoption advocacy to accolades. Most humans on the other hand do thrive on recognition by their peers for achievement. For several years Layla has served a judge the book category for the CWA but not this year. She did judge in another category but did not submit any photos, articles or our blog for awards considerations. We can now share the three judges’ notes about our winning book. Judge #1: What a wonderful book this is! Even if Wilde was not to focus specifically on black cats, the photography and stories in the book stand on their own as works of art. The cats tell their stories themselves, and while often poignant and heartbreaking, they never cross the line into melodramatic. Indeed, some are quite entertaining! I loved Prince Buddha’s story of he and his siblings out-hiding everyone, and their observations of the too-dirty apartment and the horrid cat sitter. The photos in this book are remarkable. First, black animals are notoriously difficult to photograph and not have to look like silhouettes. The definition of body and fur is very clear. Most photos are of very good quality, which is also difficult to achieve in a series of candid photos. So, high marks for technical achievement! Then the subjects and poses. I could laugh at Leopold’s curvy tongue activities every day. Sophie is quite the striking model! And the photos of many cats out for adventure are just a delight! 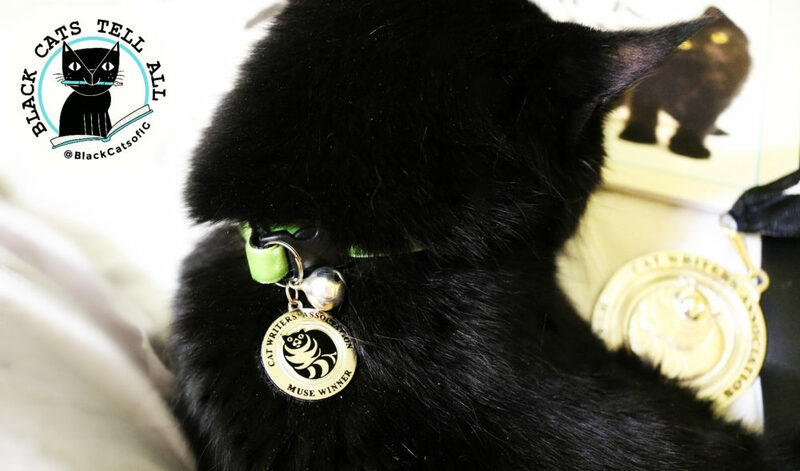 Layla Morgan Wilde has indeed accomplished her mission of making the case for including black cats in our lives, and I hope that her work will help more black cats find their new owners. Judge #2: The photographs are beautiful. Each cat has their own story. Interesting to read and look at the photos. Easy to read online. It would be a great gift for any cat lover. Judge #3: This was clearly a lot of work! I love relating to all the names everyone calls their own cat. There was occasionally a bit of confusion regarding what some cats were doing on a page or spread that had a story about another cat. The pictures are beautiful. The cause is wonderful. I enjoyed the division by seasons – I liked having options for reading and just looking at photos. It sometimes got a little busy and I wondered why some cats were included in more than one place. Overall, it’s a lovely package and I’m sure black cat lovers would enjoy receiving it. Thank you, thank you, thank you! Well, that was validating and kind of nerve-wracking since the judges are anonymous. Chances are Layla knows them but it’s reassuring to read comments from a hopefully neutral judge and not a customer. 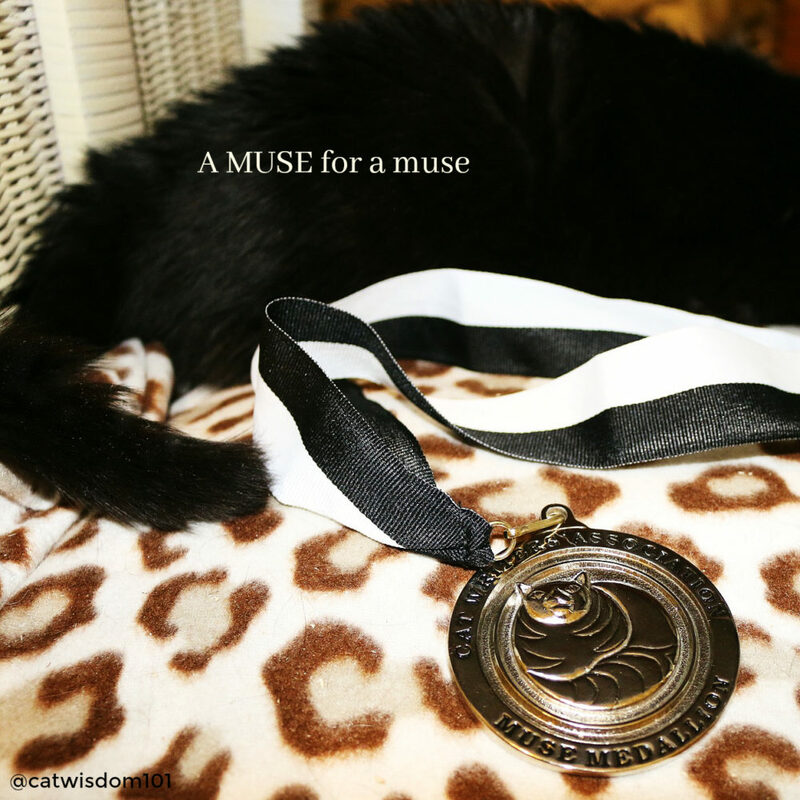 The MUSE is as large and heavy as an Olympic medal and way too big for me to wear but we also received mini-Muse. Layla thought it would look cute as a tag on a collar. 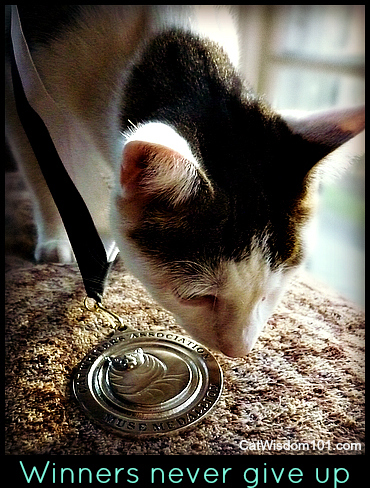 I’m not a flashy, collar-wearing cat but I must say the medallion is handsome. And since I am a contributing writer and editor, I guess I’m now an award-winning writer and editor. I promise not to let it go to my extra large furry head. After giving Layla an impossible time in our photo shoot, I finally faced the camera to give my appreciation. Now, the award that moved Layla the most was the special award because it was a total surprise. The fact that the judge is the CEO of a respected shelter made it all the more meaningful. Judge’s comments: This was a difficult choice. All three are creative, very well written and effectively educate the reader. However, the breadth of stories, points of education and imagery found in Black Cats Tell All truly sets it apart. It offers so much in terms of not just advocating for black cats but for cats in general and their incredible diversity of personality. Judge bio: Rich Anderson has worked in the nonprofit sector for nearly 30 years, much of that with animal welfare and rescue organizations, including the Humane Society of Broward County, and as a consultant for the ASPCA; North Shore Animal League; and World Society for the Protection of Animals. Mr. Anderson joined Peggy Adams Animal Rescue League in June of 2011 as Executive Director/CEO. A native of Rhode Island, Rich received his bachelor’s degree in print journalism with a minor in international studies from American University in Washington, D.C. He lives in West Palm Beach with his wife Lisa, two daughters, and three dogs – Rex, Roxie and Minnie. If you prefer to shop on Amazon, this is our affiliate link. Congratulations on this exciting news!!!!! Very happy to hear! Alice is purring with excitement 🙂 Nuch deserved for all the time & effort you committed to this project! Bravo! We are so happy for you, and proud of you, Layla and Clyde. 🙂 And to think, Clyde … we knew you way back when! Love and hugs! I cannot begin to tell you enough just how THRILLED I am for you! As one who knows “first paw” about the blood, sweat and tears that went into that book, I am sooooooooo happy for you !!! The awards are BEYOND well deserved!!! You poured your soul, every bit of your energy and being into that book for sooooooo long! I could NOT be happier for you! Sending much love and TONS of Congratulations! Such wonderful praise for your book (or should I say, purr-raise?). I knew in my heart when you first told me of your idea that it would change the world’s perception of black cats and I’m so happy to see it has. Awards are nice, they really are, but knowing you have done good for those felines you care so deeply for really is the most special award of all. Purrs from Deb and the Zee/Zoey gang. Thanks so much Deb and for stopping by. I know how crazy busy you are now. Yup, validation is a nice but temporary. Making a difference is forever. Clyde, that award looks quite handsome on you, wear it with pride! Layla you are missed on social media, but truly understandable. Get out and enjoy life and the sunshine. I apologize for not being around much, here it is 2am, I am tired ad typing there is just too much happening. I am nearly at the point of stepping away too from social media. There are places I want to visit but dont have time…. my happy places like yours are pushed back to the wayside. But enough complaining and such. I am so happy for you and the awards although the sacrifice was great. It enables more cats to be rescued, and loved for after all love is everything. BTW Punchy is still with us. He unlike Clyde is a heat seeker. He naps mostly in the garden snuggled in the straw. On rainy days or nights like tonight he curls up in the garden shed. He dreams his day away and now loves to pampered every chance he gets. 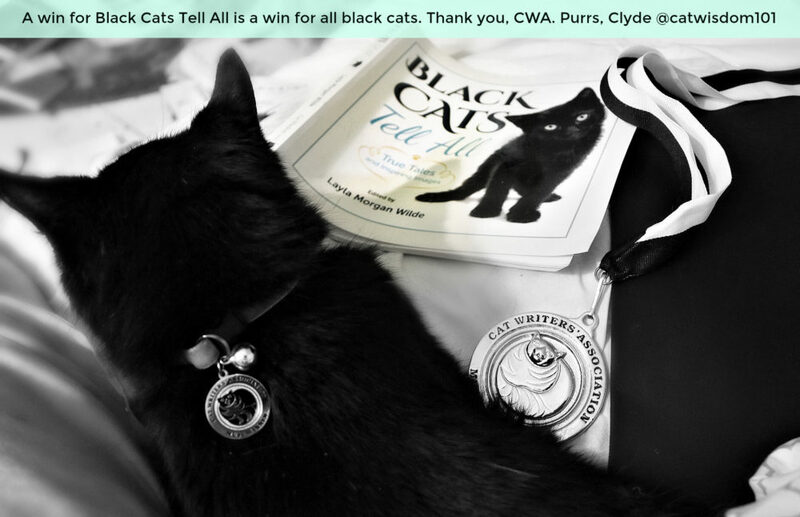 Layla, congratulations on all the awards you won for Black Cats Tell All. Julie says it is so nice to see black cats being appreciated. From this post, we can tell the photography is great! Congratulations on your well deserved awards. We still would like to review your book and host a giveaway if we could. BIG congratulations on your wins! Thanks, also to your human and her work as CWA blog editor. CONCATS!!! WE TOLD YOU SO!!! We knew all along that this book would be exquisite and others would realize it too! It is beautiful no matter how you look at or read it. Congratulations on your awards, Clyde and Layla. I sympathise with you not liking the heat Clyde. My medication has made my thermostat pack up completely and anything over 65F feels like 100+ to me! Many thanks xox. I heard the weather has been hotter than usual but at least you’re not in a big city. Big concats, Clyde! I’m not a fan of the heat either. TW can tell you how I won’t eat much and lay around even though we have the ac blasting. Thanks CK from one clever cat to another xo Yeah, heat is an appetite killer. Concatulations! We are very happy for all of you. 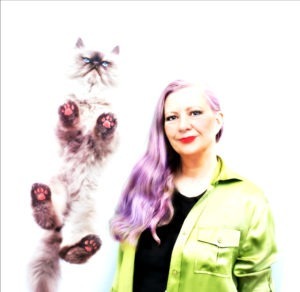 Thanks for visiting our blog today, and yes, we did see your cat cafe list. It’s so exciting that there are so many! Merci bien and boy did you surprise me with all your new adventures. Stay cool and away from power tools! Congratulations! This is thrilling! Especially so, since our kitties stories are part of this book! Thanks for including us! Kathryn, thanks so much and look for an email from me.